ASSAR ACHITECTS responds with relevance to the different needs of the stakeholders present in the pharmaceutical and biotechnologies industry, quality control or research and development activities, as well as the healthcare and hospital sectors. – Offers a “made-to-measure service” for complex technical and architectural projects, demanding a very high quality level of conception execution and management. – Develops the adequate architectural and technical answers, defined as entire and coherent system. – Analyses each constraint with its future users, in order to answer all needs, in an optimal way. Each project is thus intrinsically unique and meets the specific needs of the users and the industry standards. – Manages the multi-field commitment of the disciplines, by the synergy of the skills between users, architects and engineers. – Audit, feasibility studies, master planning, programming, architecture, design and interior design, space, planning, project planning and management, cost management, construction management, execution follow-up, building site management, Health & Safety coordination. – Industry, biotechnology and healthcare sectors: design, realization and site follow-up of research and development centers, laboratories, clean rooms and hospitals. 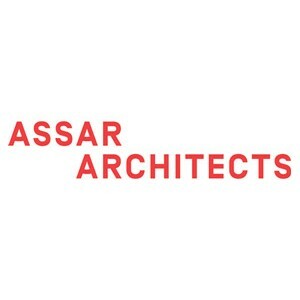 – ASSAR ARCHITECTS has also been present for 3 decades in the main other traditional sectors of architecture and construction sectors.